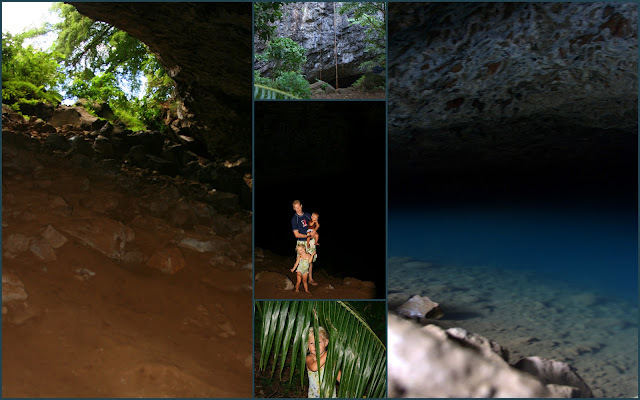 There are three caves on the North shore of Kauai near Tunnels and Ke'e Beach. Two of them are visible from the road while the third, named upper Waikapala'e Cave, is accessible by a short hike. The entranced to the cave is filled with vines hanging 300 ft. from the top of the rock wall. I can imagine Tarzan swinging from tree to tee. Once we reached the opening we had to climb down to the fresh water pool at the bottom of the cave. The only light coming in is from the entrance up top. As you can see from the picture of Todd and the kids, it's pretty dark. The cave contains a clean, freshwater pool. It's called the blue room because those who swim to the back portion of the cave and look out towards the opening, can see the light turns everything blue. Todd opened the shutter of the camera for 20 secs. to capture as much light as possible and was able to take some gorgeous pictures.